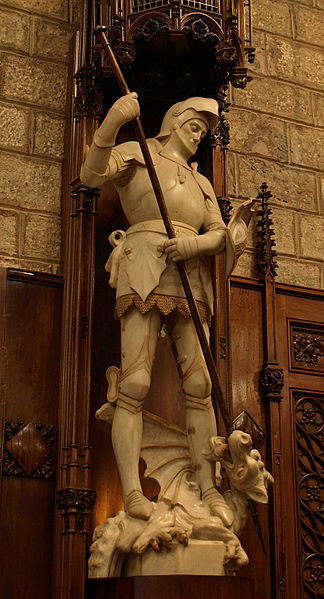 Statue of St. George inside the City Hall, "Saló de Cent", Barcelona. Martyr, patron of England, suffered at or near Lydda, also known as Diospolis, in Palestine, probably before the time of Constantine. 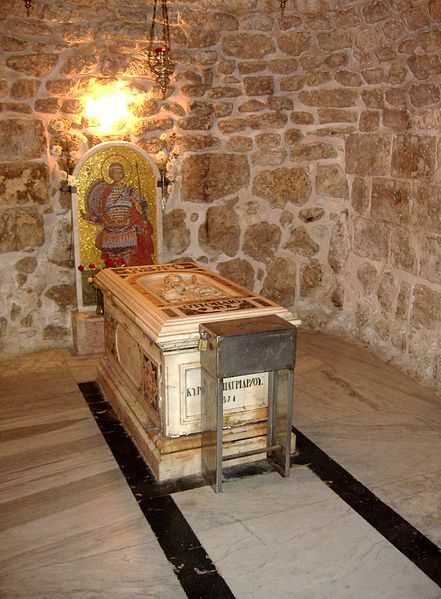 According to the very careful investigation of the whole question recently instituted by Father Delehaye, the Bollandist, in the light of modern sources of information, the above statement sums up all that can safely be affirmed about St. George, despite his early cultus and preeminent renown both in East and West. 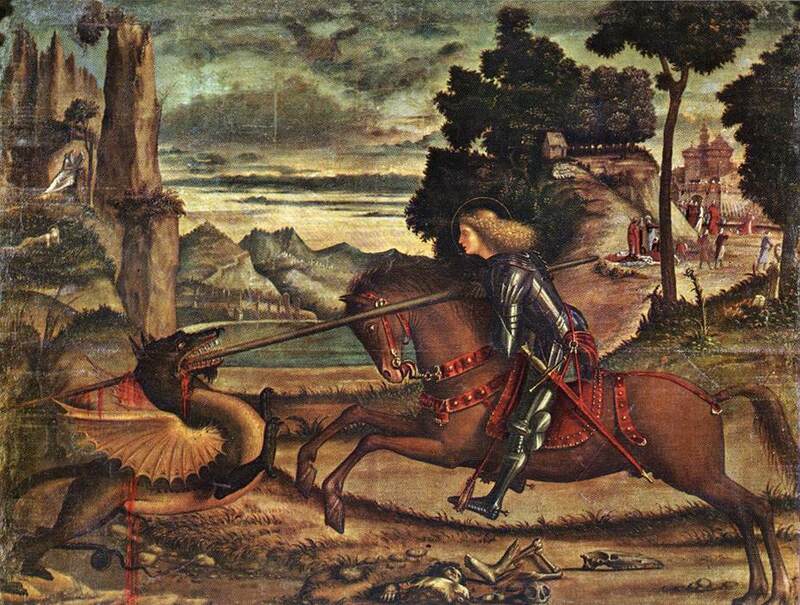 The best known form of the legend of St. George and the Dragon is that made popular by the “Legenda Aurea”, and translated into English by Caxton. According to this, a terrible dragon had ravaged all the country round a city of Libya, called Selena, making its lair in a marshy swamp. Its breath caused pestilence whenever it approached the town, so the people gave the monster two sheep every day to satisfy its hunger, but, when the sheep failed, a human victim was necessary and lots were drawn to determine the victim. On one occasion the lot fell to the king’s little daughter. The king offered all his wealth to purchase a substitute, but the people had pledged themselves that no substitutes should be allowed, and so the maiden, dressed as a bride, was led to the marsh. There St. George chanced to ride by, and asked the maiden what she did, but she bade him leave her lest he also might perish. The good knight stayed, however, and, when the dragon appeared, St. George, making the sign of the cross, bravely attacked it and transfixed it with his lance. Then asking the maiden for her girdle (an incident in the story which may possibly have something to do with St. George’s selection as patron of the Order of the Garter), he bound it round the neck of the monster, and thereupon the princess was able to lead it like a lamb. They then returned to the city, where St. George bade the people have no fear but only be baptized, after which he cut off the dragon’s head and the townsfolk were all converted. 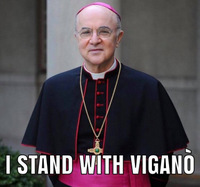 The king would have given George half his kingdom, but the saint replied that he must ride on, bidding the king meanwhile take good care of God’s churches, honor the clergy, and have pity on the poor. 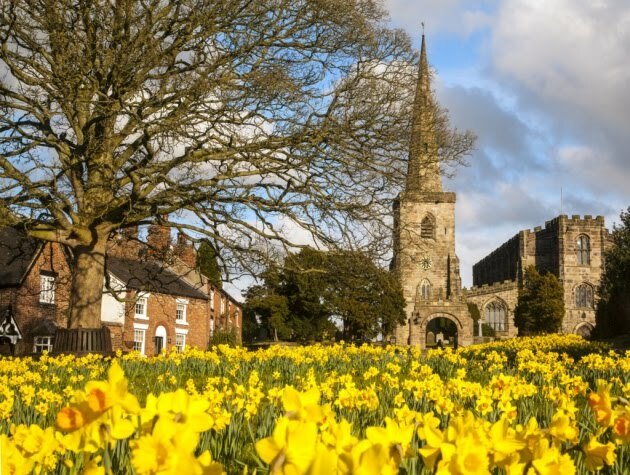 The earliest reference to any such episode in art is probably to be found in an old Roman tombstone at Conisborough in Yorkshire, considered to belong to the first half of the twelfth century. Here the princess is depicted as already in the dragon’s clutches, while an abbot stands by and blesses the rescuer. St. George and the Dragon statuette was commissioned by Duke Wilhelm V. Duke Wilhelm’s son, Maximilian I, had the original ebony base replaced with the present sumptuous pedestal. 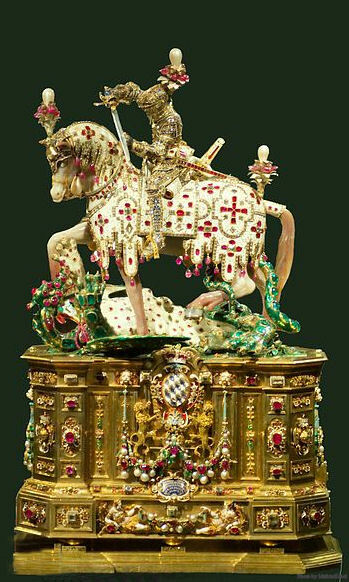 The entire statuette consists of 2,291 diamonds, 406 rubies, and 209 pearls. At the base, the inscription in gold letters reads: “Maximilian, Count Palatine on the Rhine, Duke of the two Bavarias, Elector of the Holy Roman Empire, dedicated this to the great martyr St. George, patron and protector of his house and family.” Well concealed by this lavish decoration is a tiny drawer containing a reliquary of St. George jeweled as elaborately as all the rest. This statue is housed in the Residenz Museum in Munich, Germany. The tiny statuette is barely 20" high from its base to the pearl on the knights helmet. Saint George was a man who abandoned one army for another. He gave up the rank of tribune to enlist as a soldier for Christ. Eager to encounter the enemy, he first stripped away his worldly wealth by giving all he had to he poor. Then, free and unencumbered, bearing the shield of faith, he plunged into the think of the battle, an ardent soldier for Christ. Clearly what he did serves to teach us a valuable lesson: if we are afraid to strip ourselves of out worldly possessions, then we are unfit to make a strong defense of the faith. Dear brothers, let us not only admire the courage of this fighter in heaven’s army, but follow his example. Let us be inspired to strive for the reward of heavenly glory. We must now cleanse ourselves, as Saint Paul tells us, from all defilement of body and spirit, so that one day we too may deserve to enter that temple of blessedness to which we now aspire.